Having the ability to adjust your speed while still being able to take advantage of the soft start function of a fluid coupling. We can offer 3 different designs to suit your different drive requirements. Scoop controlled fluid couplings replace the rotating body style of fluid coupling with a solid housing that can be bolted down. 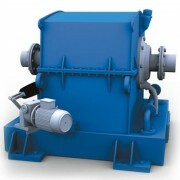 They also allow you to control the speed of the output by adjusting the position of the scoop. These couplings can transmit up to 3500kw. Newly introduced FNCT fluid couplings work on the principle of hydrodynamic power transmission with Fill Control. 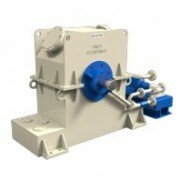 These are ideal as start-up and acceleration control equipments for large drive motors. Combined with electronic control they provide additional safety to drive motors and torque transmission control. Ideally suited for Belt and Pipe Conveyor applications, Crushers, Ball and Rod Mills, Shredders, Mixers, Beaters and other similar applications. Robust construction with trouble free operation in dusty, hot and humid ambient conditions. Fluidomat offers drain type fluid couplings HLN-LC for combustion engine drive. 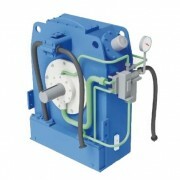 The coupling is enclosed into a stationary housing which is connected to the engine by SAE housing. Suitable flexible coupling is provided for connection to engine flywheel. The HLN couplings meet the requirement of power take off unit with all the advantages of fluid coupling. • No loads start-up of Engine. • Absorbs shock loads and dampers torsional vibrations. • Smooth start-ups of driven machine. • Belt Slippage avoided in belt drives. • No wearing parts and long life.